Bar open Tue-Sun 11am-midnight. Closed Mon. Food served Tue-Sun 11am-10pm. Closed Mon. Pre-theatre times Tue–Thu 5–9.45pm; Fri/Sat noon–6.45pm; Sun 3–9.30pm. Compact steakhouse in Shawlands dishing up hickory-smoked grills, including super steaks, plus bar snacks and cocktails in a mezzanine bar. The interior of this family-run steak restaurant is casual and svelte, with big booths and quirky touches – wooden spoons on the walls, funky little frying pans hanging from the ceiling and twinkling fairy lights. Gallus staff serve up a side order of banter along with top notch service, while a fabulously funky soul, jazz and rock ’n’ roll playlist adds to the chilled, welcoming atmosphere. Start with a dish like mussels provençale, with bread to mop up the rich tomato and garlic sauce, or try the tempura king prawns, which come in a light, crunchy batter. 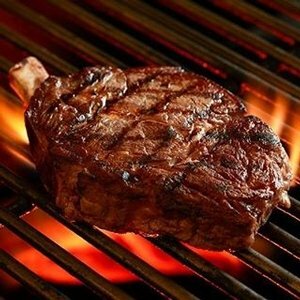 The steak is cooked on a hickory-smoked grill, which gives the excellent quality meat a wonderful, smoky flavour. If going for anything less than medium, it’ll be like Turkish delight when you cut into it: soft, pink and glistening. Other main courses include spaghetti arrabbiata, beef stroganoff or huge chunks of spicy chicken served on crisp cos lettuce with garlic mayo. A bar menu is available at lunch times and some evenings, offering more casual bites like nachos or sandwiches – but you really should go for the steak.